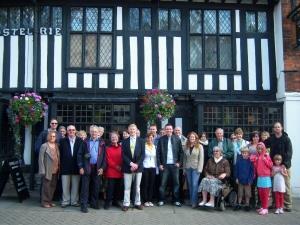 Join the award winning Stratford Town Walk for a festive guided walk on Christmas Day! Discover Stratford’s history & fascinating relationship with William Shakespeare. Hear stories of fire, flood & plague, ’Christmas wrapped’ with old fashioned sayings and medieval cures. Starts at 10.30am for approximately 1 1/2hrs. Adults £6, children (under 16) £3, under 8yrs free! The walk is accessible and there's no need to book, just turn up by the Swan Fountain on Waterside, near the RST and opposite Sheep Street, Stratford upon Avon, Warwickshire. Ticket includes discounts for shops, restaurants, pubs and attractions. For example the Butterfly Farm, MAD museum, entry to the Shakespeare Houses and Shakespeare's School. Disabled toilets, public toilets, baby changing facilities, public telephone available nearby. Wheelchairs and mobility scooters can be hired free of charge from Shop Mobility in Bridgefoot multi-storey car park. Arrive around 10.20am for a 10.30am start. Telephone enquiries any time between 9am and 6pm. From the Stratford Tourist Information Centre head towards the town centre and take the first road on the left (Waterside), towards the Royal Shakespeare Theatre. The guided walks start on Waterside, by the swan fountain, opposite the fish & chip shop on the corner of Sheep Street about 100 yards in front of the theatre. Disabled parking nearby meeting point.